Everybody knows that all the third party twitter services are too many, but it's also true that all of them help Twitter to became what is it today, for example : Pics, Video, Links, Location sharing, etc. 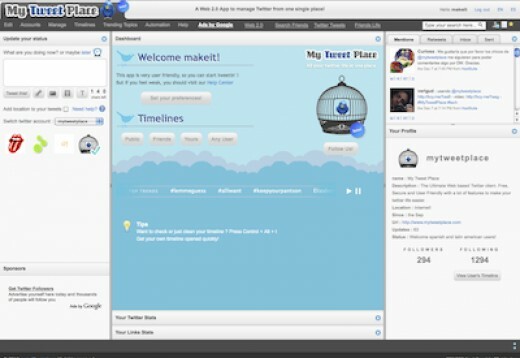 Basically, My Tweet Place is a web 2.0 app that allows you to manage multiple Twitter accounts and many of its related online services on a single website, so it includes all the basics from Twitter.com with many other services that are not included by default on twitter's official website. Manage multiple accounts without a single page reload, using Twitter's OAUTH to protect your identity. That makes it a usefull and secure site for its users. Update your status of different accounts at the same time, Allowing you to shorten URLs( through Bit.ly.). Sharing Photos (through TwitPic) and videos ( through TwitVid) without the need of open a new tab on your browser! Schedule tweets to post them on a future date and time. That allows you to manage your campaing daily, weekly or just personal tweets. Thanks to the modern web browsers (Firefox, Chrome, Safari, etc) you can share your location and then your followers will now where you are! You can also watch where they are on a google map if they are sharing their location. Watch your friends and public timelines, or your own too. You can also watch current, daily and weekly trends! Analize the progress of your followers, showing the stats of the last 2 weeks! 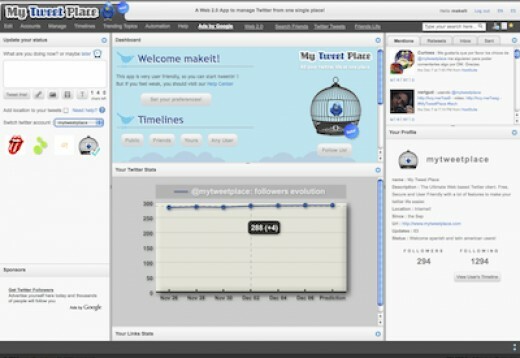 Watch the impact of the links you tweet using the bit.ly tool, how many visits and where they come from. 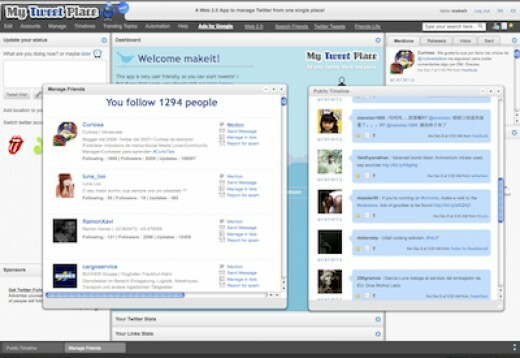 In fact, there are a lot of features offered by My Tweet Place when talking about twitter and the best part is that runs in your browser, so there is no installation required and it's user interface it's very user friendly and desktop like! At this moment My Tweet Place is beign used for thousands of twitter users from all the word. Seriously - are we to believe that the Rolling Stones licensed a song to you to use with your product intro video? It's one thing for an individual to download a song for personal use to their computer or ipod. It's another thing for a company to take a song without permission and use it on their website. It's copyright infringement. If you actually have permission and pay royalties, then I apologize for this post but I'm skeptical that you do.